DATE OF ISSUE: March 12, 2002. DENOMINATIONS: FJD 69¢, FJD 89¢, FJD $1.00, FJD $2.00. STAMP SIZE: 30mm by 47.5mm. Z I Gutenberg, 28240 La Loupe, France. HISTORY: Post FIJI Limited is the designated Public Postal Licensee in Fiji. In March 2002, Post FIJI Limited (Suva General Post Office, 10 Thomson St. Suva) released a set of four stamps paying tribute to the island's botanical bounty. 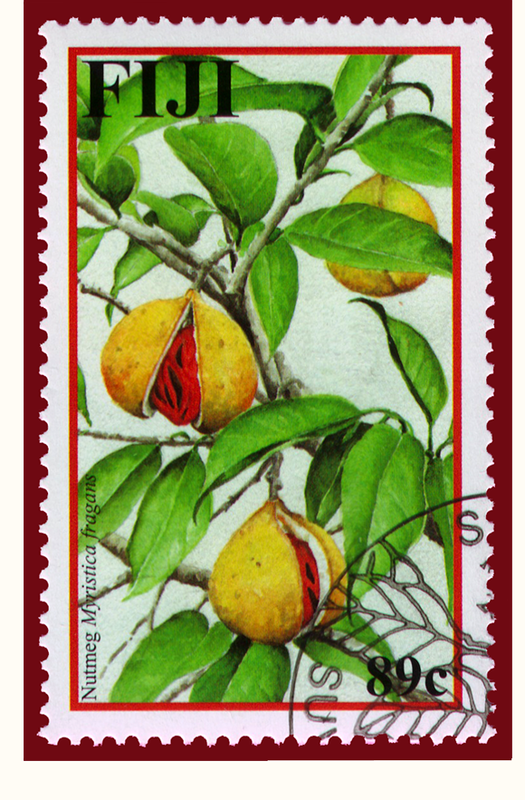 The stamp set recognizes pepper, nutmeg, vanilla and cinnamon. Fiji is an island nation northeast of New Zealand. The first Fiji postal stamps were issued on November 1, 1870 but were curtailed when the British passed the Cakobau Postal Act the following year, thus regulating postal services for the island. Now, 130 years, Post Fiji Limited prides itself by issuing a multitude of world-class products and services. This 2002 series of 4 stamps, commemorates the Spices of FIJI with beautifully artistic botanical renderings. Because of Fiji's isolation from Europe's early exploration and traded routes, its commercial potential remained under developed, preserving its natural allure. A 1924 United States Geological Survey, Professional Paper 92, by Edward Wilber Berry identifies that the world wide account of the Myristicaceae Family "number about 90 forms" of which the "number of commerce . . . has about 15 existing species". Of commercial interest, he says, "Many are certainly insular and coastal forms, their range in the Pacific extending eastward to the Fiji, Tonga, and Samoan Islands, the Fiji Islands having four or five species." Eighteenth century European exploration reported that nutmeg was indigenous to this region, yet, scant reference exists regarding any early historical account of nutmeg (myristica fragrans) from the Fiji Islands.